The Cosy House Collection Luxury Bamboo Sheets, while a mouthful, are pretty decent sheets for a great price. They currently have a 4.3 star rating on Amazon, and they have a lot of positive reviews. However, does that price mean that the quality is just as low? Let's find out. The Cosy House Collection Luxury Bamboo Sheets are actually a blend of bamboo rayon, or viscose, and microfiber. These consist of bamboo that is blended with other fabrics like cotton, polyester, and microfiber. While the bamboo blends are typically stronger and softer than other bamboo fabrics, they usually use bamboo rayon as the base for the blend, which makes them definitely not eco-friendly. 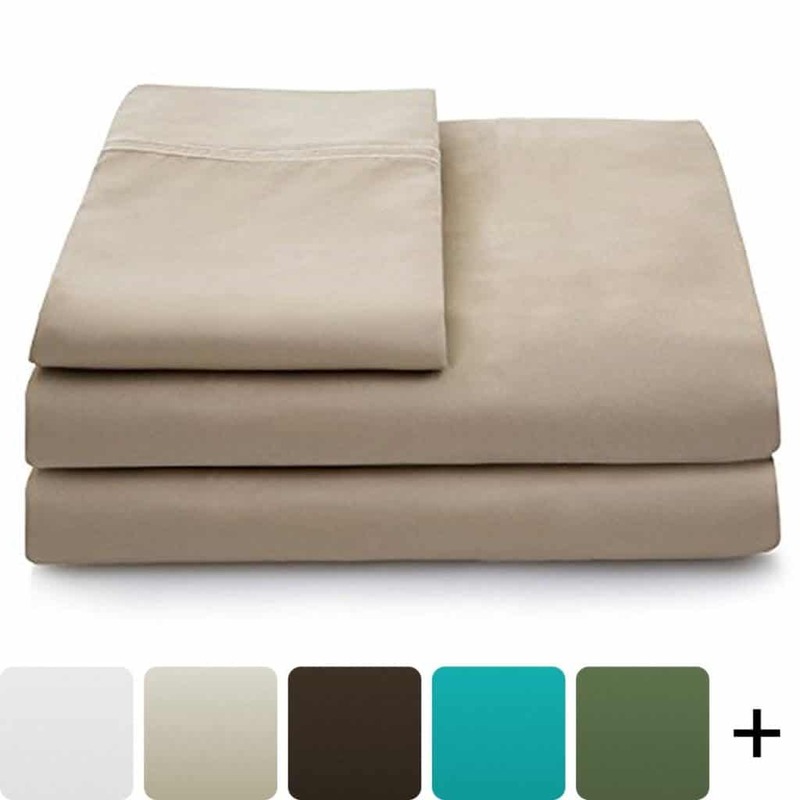 This bamboo sheet set is 60 percent bamboo rayon, and 40 percent microfiber, so at least there is more rayon included than most blends. These sheets are also able to fit most mattresses that the sheets are sized for. The maximum depth of these sheets is 16 inches deep, which is pretty generous. The complete sizing and what are included in the set, when looking at the Queen bed size, is as follows: fitted sheet at 80 inches by 60 inches, flat sheet at 105 inches by 90 inches, and the pillowcases at 20 inches by 30 inches. Overall the measurements are pretty standard, but at the same time generous. The sheets are also available in many different colors. For the queen mattress set, the colors include black, chocolate, and turquoise, but there are many other colors available for the different sizes. Speaking of which, you can get these sheets for any bed size from full to split king, the split king size bedding being the most expensive. However, the most expensive one is still only a few dollars more than the queen set, which is actually surprising. As with all rayon bamboo sheets, they are unable to retain any of the benefits that the original bamboo plant had. This is because the way to make rayon or viscose uses harsh and toxic chemicals to regenerate and bleach the bamboo fibers. The use of these toxic chemicals also ends up stripping away any beneficial properties the bamboo once had. What is more, the fact that the Cosy House Collection Luxury Bamboo Sheets are a blend with microfiber, means that they have even less hypoallergenic properties than it may have had. That being said, these sheets are no without their specific features. The fact that they are a blend, does make them harder to wrinkle. This means that there is less ironing to do to make your bed sheets look presentable. In addition, the level of care that these sheets require is very minimal. You can put these sheets in a normal wash, and they are dryer friendly. This means that you can throw these in the dryer and the sheets will come out fine. Cosy House was founded in 2014 in an attempt to be a bit different than the other bedding industry companies. The founders realized that there were so many middle men between the manufacturer and customer, and that markups of 1,000 percent were becoming the norm. Because of that, they decided to do the importing themselves and skip over the middle man. They wanted to get the products directly to the customer. Now, they have a pretty decent product line. The products they have available now include various bedding sets for all sizes, mattress protectors, pillowcases, pillows, duvet, and duvet covers. In terms of their bedding sets, three of the five they have available are made from bamboo, with the other two being microfiber. The Cosy House Collection Luxury Bamboo Sheets are a blend of 60 percent rayon bamboo and 40 percent microfiber. This makes them very soft and even more durable. It also makes them wrinkle free, which minimizes the care required for them. In terms of keeping them clean, the care level is lowered even more. These sheets are machine washable and dryer friendly, so there is no need to spend the time to hand wash or air dry them. This is different than some of the other variations of bamboo fabric. The sizing of the queen mattress bed sheets is rather generous. This is to be sure that they can fit any style of mattress. The maximum depth is also 16 inches deep, which is nice. The price of the Cosy House Collection Luxury Bamboo Sheets is absolutely crazy. It is probably some of the cheapest I have ever seen. However, if you look on their website, you can see that the current price is actually a sale price from their original price that was $169.95. However, all of their sheet sets seem to be on sale, so it is unsure if it is really a sale on the sheets or they are just marketing them that way to get more sales. Since the Cosy House Collection Luxury Bamboo Sheets are a blend of bamboo rayon and microfiber, the beneficial properties that may have managed to reside in the bamboo rayon after processing are minimal. However, the company still markets it as hypoallergenic, though how true that is, is unknown. Many of the critical reviews of these sheets have said that they feel very low quality. Many have said that they are thin, scratchy, and full of pilling. Also, the pillow cases seem to have not been sewn properly and have been left unsewn at the ends. Now, that last one may just have been a fluke, but you never know. Going to back to the price of these sheets one more time, keep in mind the critical reviews. On their Amazon product page, the prices are listed as the regular price, whereas on the website the prices are made to seem like a sale price, with the original price slashed out. Personally, this looks like a marketing tactic to give the sheets a more expensive look to them. People tend to be drawn towards something that was expensive that is now on sale. Besides, after taking a look at the critical reviews, it provides even more proof that these may not be as high quality as they seem. Unfortunately, there is no way to tell whether the critical reviews are the norm, or if they were just unfortunate happenstance. But if you want to try the Cosy House Collection Luxury Bamboo Sheets out for yourself, you can grab them on Amazon for $39.95. For any other information, including the best bamboo sheet set, head on back to our bamboo sheets review on Green and Growing. Here are some top questions that I found for people seriously considering buying the Cosy House Collection Luxury Bamboo Sheets. Are these sheets breatheable? Typically, microfiber is not very breathable, but due to the sheets being 60 percent bamboo rayon, they are better than 100 percent microfiber. Do these pill overtime? From the looks of the reviews, it seems not.